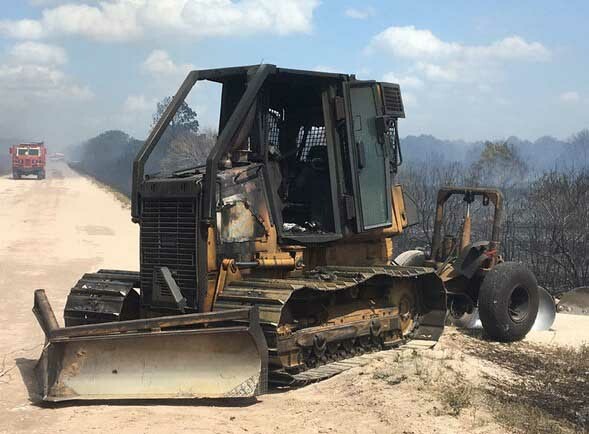 Florida Fire Danger Map..................Bulldozer lost to a wildfire about 13 miles southwest of Yeehaw Junction, 4/16/2017. The operator escaped unharmed. The fire eventually grew to 450 acres. 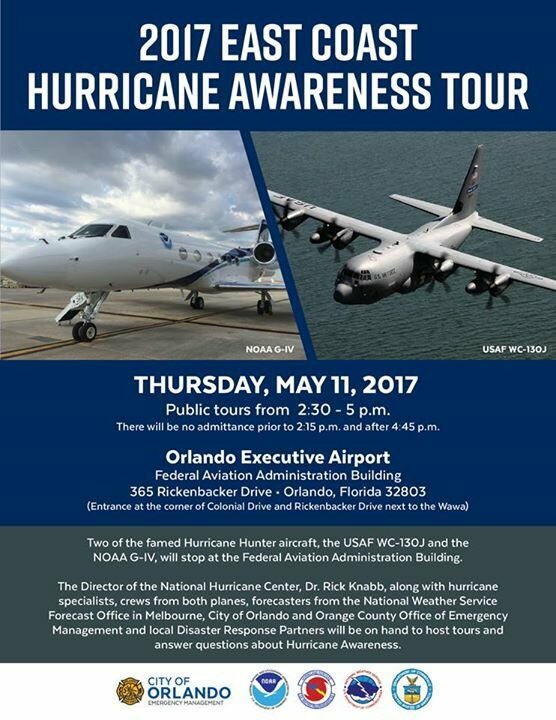 Though Central Florida had a greater increase overall in the number of wildfires burning over the last week, as well as near daily major road closures, South Florida still has the largest active Wildfire. 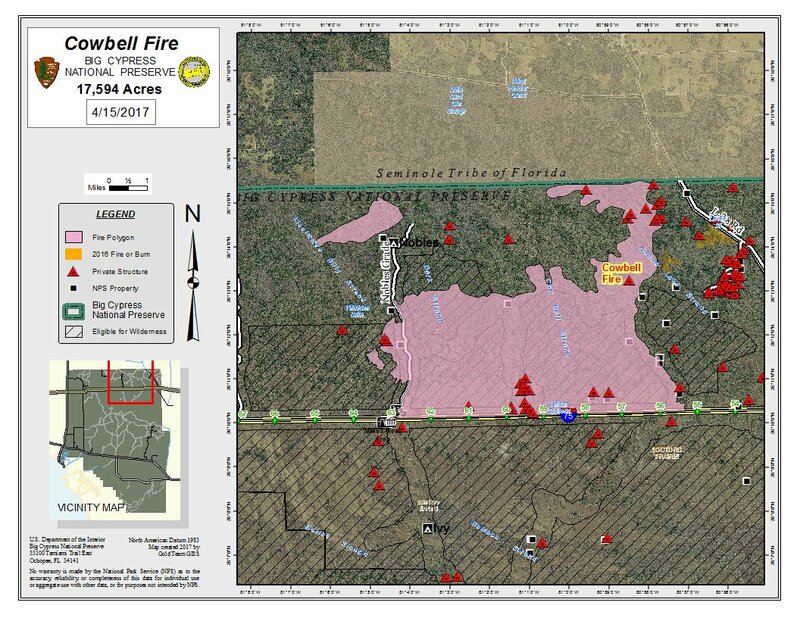 The Cowbell Fire is now 17,594 acres and 50% contained. 294 personnel are working the wildfire with seven helicopters, two single engine air tankers and 22 engines. Yesterday, in favorable fire conditions a spot fire took hold west of Nobles Grade, increasing the overall fire size by 636 acres. Today firing will continue on the West and North sides trying to keep the fire out of Kissimmee Billy Strand and Big Cypress Preserve. South and east sides mop up continues. The structural preservation crew is removing equipment to protect the Sanctuary Community. Several closures are still in effect. Sunday, April 2, 2017 had a High chance of severe weather. Monday's convective outlook was an Enhanced Risk of severe potential. Tuesday, flooding rains are occurring across Northern Florida, there is also two areas with enhanced risk. Wednesday (4/5) the severe weather is expected to increase with Moderate risk across much of the Southeast, northward along and west of the Appalachians into the Ohio Valley, Wednesday through Wednesday night. This is expected to include supercell development with a risk for tornadoes, some of which could become strong and long-lived, particularly across parts of the Southeast. There has been two fatalities, a mother and daughter. Their mobile home was blown off it's foundation. One tornado has been spotted by a police officer in Kerr, TX. The second was in RAPIDES LA. There was a roof blown off and metal debris flying around. There was a long tracking tornado in central Louisiana with and injury injury in FRANKLIN LA when a tree fell on a car. Other tornadoes were spotted across Louisiana. Wind has damaged many trees including Pecan. The second story of a structure was damaged and a large metal structure was destroyed in Kendall, TX. Some horse barns were hit, at least one destroyed, a shop lost it's roof, a Sonic sign was destroyed, another person was trapped in their car. 4/3 SPALDING GA was hit by a tornado, several homes were destroyed, people were trapped and rescued. SCHLEY GA had metal in the trees. There was also an injury there when a tree fell on a home. MONROE GA had many trees down, some on houses with homes damaged, one destroyed, the family was rescued. Largest hail has been 1 3/4inches is different locations in Texas, Arkansas and Mississippi. The larger hail seemed fairly consistent with this storm until Monday when the largest hail size was 1 1/4inch in both Georgia and Kentucky. Moday there was alot of wind damage from Arizona to Florida but mainly in Georgia with alot of trees vs power lines. There was a trampoline in the power lines and some structures destroyed. There was another fatality in UNION SC where a mobile home was blown into a road and destroyed. There was two injuries in COLUMBIA GA when a dock failed at a marina. Missouri was the worst hit. A tornado hit a school in Goodman, MO. Preliminary survey showed EF-2 damage. Wind was a factor mainly in MO, OK, KS, TX, AL and FL. Mostly tree damage and trees into power lines. A chicken barn was destroyed as was a carport. There was some homes damaged and roofs lost. Highest clocked winds were 80mph in Goodman, MO. Hail was wide spread, the size of which was getting bigger by the end of the day. 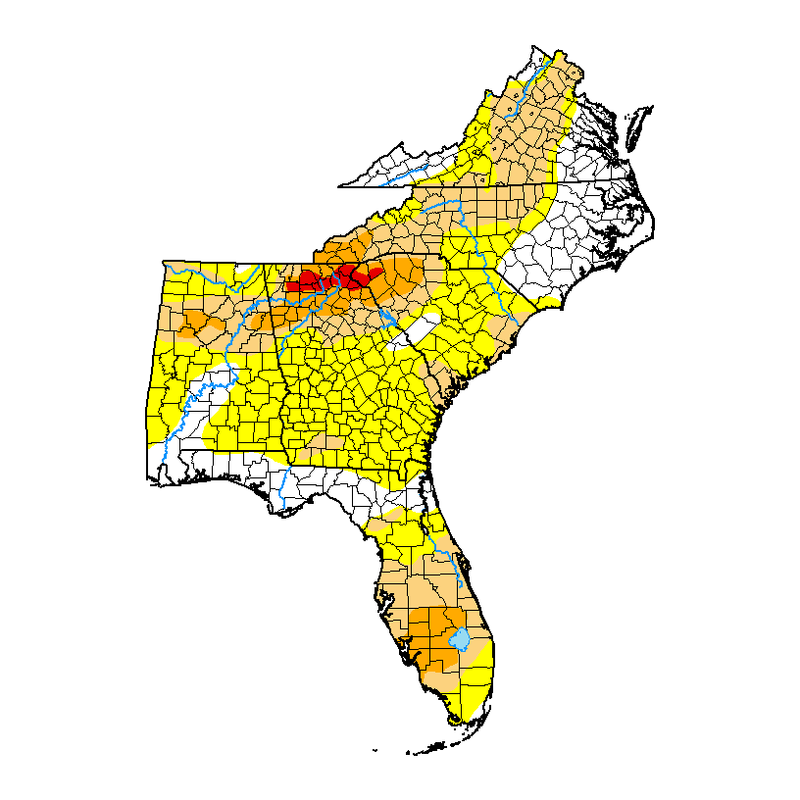 There were several 1 3/4" reports from Alabama.